One of the best things about becoming a home-owner for the first time was having the ability to add the features I had always wanted. Having a soap bottle on the counter always irritated me – it was always falling in the sink and just generally getting in my way. Although I love my home, counter space is limited and anything I don’t have to find space for is a major bonus. That’s why one of my first projects was the install a built in soap dispenser. The first thing I had to do was find out the best one for me. When shopping for something new, the first thing I always do is read product reviews. Nothing can beat reading first-hand experiences with something, whether they are good or bad. Here I have gathered some of the best-rated built-in soap dispensers and talk about why I seriously considered buying them. Read through until the end and I will let you know what I use in my house! With this dispenser, I love the fact that it can be refilled from the top. Crawling around under the sink and trying to pour soup without spilling it does not sound like my idea of a good time. I also love that it holds a lot of soap so that it can be filled and then forgotten for a long time. Another reason to give this soap dispenser serious consideration is that it is easy to install. The hole you need to drill into your sink or countertop is only 1.25 to 1.5 inches. The finish is made with multiple layers, something that helps it resist rust and corrosion. The materials used to build it are stainless steel and PE plastic. To clean, all it needs is a quick wipe down with a damp rag. After searching the internet, I could not find any negative reviews or comments about this product, making it a pretty safe bet when shopping for a built-in sink dispenser for your kitchen. This dispenser comes in either brushed nickel or stainless steel, allowing you to match your kitchen sink well. Brushed nickel is a beautiful material for kitchen sinks because it does not show water spots. Like many dispensers these days, it allows you to refill it from the top, which is incredibly convenient. It comes with a nice, long bottle that can hold 13 ounces of soap. The manufacturer offers a 5-year warranty on it, which is always reassuring. There is an abundance of reviews and ratings of this product online. While the majority of them are positive, there are a few who complained about the durability of the product. There were also a few mentions of it getting clogged occasionally. All-in-all, the majority of feedback is positive and I believe this is a product worth considering. This option is a little pricier than the above two but definitely worth considering. One of the things that makes this a good option is the included hardware. Instead of coming with a brass nut that is likely to corrode, it comes with a heavy-duty plastic one that will stand up to getting wet. It comes with a funnel to make filling the dispenser even less messy, and it also can be filled from above. The champagne bronze finish is gorgeous and adds a touch of class to any kitchen. It comes with a faucet and finish limited lifetime warranty for added peace of mind. Reviewers reported this product takes about 5 minutes to install on average.With the Delta RP1001CA Soap/Lotion Dispenser, almost all of the reviews online are positive. One small complaint I came across a number of times is that it takes quite a few pumps to get it going after filling it. In my opinion, that is really quite minor, especially considering the positive qualities of this product. With the 3.15″ nozzle, this dispenser allows you to pump the soap directly into the sink. It is “self-priming,” meaning it should be easy to pump each and every time. Refilling the dispenser can be done from the top easily. This product is stainless steel, which will match many people’s kitchen sinks and other appliances. It is quite good looking and will add a touch of class to any kitchen, as well as the convenience of having soap on demand. It should be resistant to corrosion and last for quite a long time. I could not find as many reviews on this product as I generally like to read before making a purchase, which is the only reason I would hesitate before buying. The ones I did find were predominately positive, however. This product is tarnish, scratch, and corrosion resistant. If that isn’t enough, the manufacturer offers a 4-year warranty on the product, offering either a full replacement or refund. In my mind, that means this is a pretty darn durable product! That being said, this product is essentially just made of plastic. While that is not necessarily a bad thing, it may not stand up as well as metals over time. 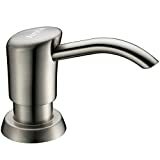 Like with any purchase I make for my home, I spent a lot of time researching and debating before eventually deciding to go with the Dish Soap Dispenser for Kitchen Sink (Brushed Nickel) with Kitchen Soap Dispenser Pump, Built in Design with Large Capacity 17oz / 500ml Bottle, Refills From the Top, Premium Stainless Steel. For me, the fact that it came with the biggest bottle was a huge selling factor. Even if most dispensers can now be filled from the top doesn’t mean I want to be bothered with it more than absolutely necessary! It has been approximately 6 months since I bought and installed this product. So far, I am incredibly satisfied with its appearance and performance and feel like I made the right choice for myself. That doesn’t mean that I wouldn’t have been happy with the other four I considered! Keep in mind your own budget, style, and needs when making the ultimate choice for you. Hopefully, these overviews have given you a good launching point! A built in soap dispenser is a common household fixture nowadays. It is not uncommon to find this equipment that dispenses soap in the bathroom or kitchen of many homes. It is usually fixed right above or next to the sink where we wash our hands or utensils. Before looking at the pros/cons of built in soap dispensers, let us get a few basic facts about these essential bathroom or kitchen accessories. 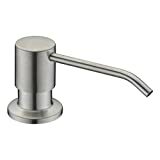 Soap dispensers are available in many different materials including plastic, stainless steel and ceramic. 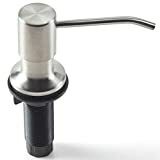 The best dispensers, however, are made of stainless steel or ceramic as these materials last the longest. In addition, dispensers come in a range of colors as well as finishes to suit every buyer’s needs. The reason why soap dispensers have become very common in many homes these days is that they are quite useful and can add so much value to users. There are many advantages of having a built in dispenser. They include the following. A built in soap dispenser totally eliminates the need for a bottle of hand soap or dish soap. You do not have to have the bottle hanging around on the counter of the main sink or kitchen. This saves space and ensures tidiness. A built in soap dispenser can be a great way to stay healthy. With one, you do not have to grab a bottle of soap, which can be dirty and full of germs, with your hand. All you need to put soap in your hand is press a button. You totally avoid a dirty object that can transfer germs to your hands, causing diseases. This equipment is quite handy and sanitary. A built in soap dispenser offers total convenience. With one, all you need to do to wash your hands is to just pump the amount you need in your hand and turn on the tap. You do not have to dig in cupboards down below each time you want soap. There is no doubt about the fact that a built in soap dispenser can help you save a lot of money. This equipment dispenses fluid soap the tiniest dot ensuring a great deal of efficiency. With a quality dispenser, you can avoid the extravagant usage of your hand washing or kitchen soap. This can significantly reduce your monthly expenses. Everything has its own advantages and disadvantages so is a built in soap dispenser. A faulty built in soap dispenser can be quite wasteful due to a dripping problem. The device may have an issue of dripping a couple times immediately after dispensing soap. This can have a detrimental impact on your wallet. A built in soap dispenser is truly a worthwhile investment for every homeowner. The device offers more advantages than one could ever imagine at any one time. For example, it keeps the house tidy and saves space. It enables users to avoid germs and many diseases. Last but not least, a dispenser offers total convenience and enables you to save money. The only disadvantage of this equipment is that it can be quite wasteful when faulty.